TO READ OUR REVIEW OF AIR PLAY - HEAD TO OUR REVIEW HERE. World-famous clowning duo the Acrobuffos are heading to Melbourne this summer to take audiences on an epic comic adventure filled with breathtaking air sculptures and laugh-out-loud physical comedy. In an Australian premiere exclusive to Melbourne, Seth Bloom and Christina Gelsone will perform Air Play from Wednesday 18th to Sunday 22nd of January 2017 at Arts Centre Melbourne’s State Theatre. Created by the world traveling comedic duo from New York City, Air Play marries their comic physical antics with the breathtaking air sculptures of artist Daniel Wurtzel to create a spectacular performance as hilarious as it is heart-warming. 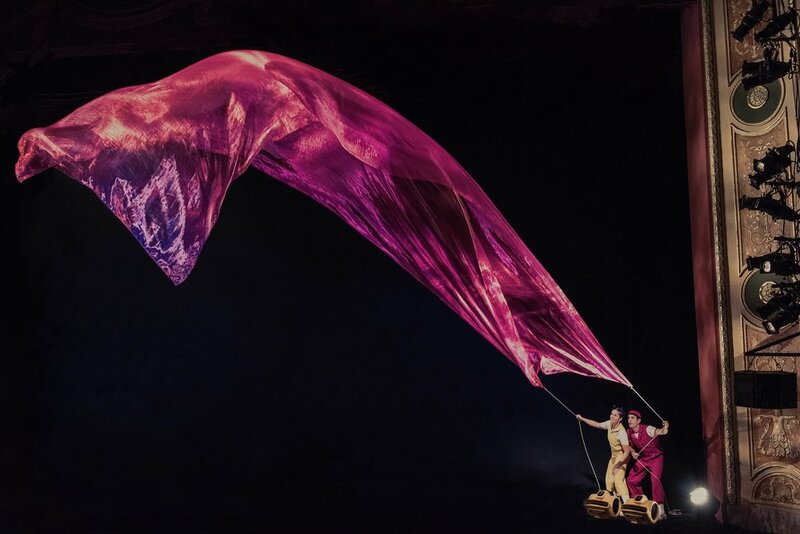 Flying umbrellas, larger-than-life balloons, kites that float over the audience and an enormous snow globe are the constant companions of a sister and brother whose rivalry is only matched by their affection. Air Play is anchored in high-flying and ground-breaking air sculptures with a colour palette and themes inspired by the paintings of artists Joan Miro and Wassily Kandinsky. Directed by West Hyler, the work is physical theatre of sky-reaching scale with myriad moments of sheer wonder. Air Play is an intended pun. Besides physically playing with air, the show’s soundtrack spins the radio dial, creating an auditory “air play”. Wordless, but far from silent, its ever-changing visual playfulness is set to a soundtrack leaping from Balkan gypsy music to Nordic boys' choir, Italian avant-garde and Appalachian ballads. Air Play will be playing from Wednesday 18th to 22nd of January 2017 at the Arts Centre Melbourne's State Theatre and is suitable for all ages. To buy PRESALE tickets, head over to this link from 10 AM Thursday 6th of October to 8:59 AM Monday 10th of October. Tickets will be on sale to the general public after these times. Tickets start at $27. For more ideas on what to do with the little ones, head to our blog or CBD Top 5 FREE activities or our popular Daily Spots List.